Page 14 is for MODERN Sonic the Hedgehog accessories only. This is the "Step It Up Sock Pack"
It's a Walmart exclusive, and, sadly...it's another pack only for little kids. Your feet probably won't fit into these if you're over 7 years old, which is too bad because it's a fun, bargain priced set. There are 5 different ankle sock pairs here. The first is blue with running Sonic & rings. The next pair is gray with the slogan "Step It Up" written in blue. The white pair has only the 'speed booster' pattern from the games across the middle. The middle pair is blue with black tips & has a Sonic portrait in a red cog / gear shape. The last pair has 'looking back' Sonic with more rings. The designs are woven into the socks, so they won't wear off with washing & use, which is always a nice feature. It's great to see modern Sonic in action oriented designs for something fresh...just too bad they're so small. This pack is about 5.50 at Walmart in 2019. It should be in the boys clothing section. The paper tag is modern with checkers, and is that "SEGA" tag that keeps popping up. It is distributed by "High Point Design" but that's not the same thing as a maker, like bioworld etc, would be. 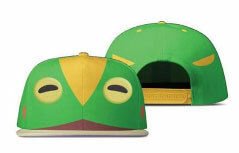 It's a ....Froggy character cap? Indeed, of all the (fairly) obscure characters to choose from, here comes a Froggy hat. This is a 'character cap' style, where the hat itself is made to resemble the character's head. It has the eyes on the front, the yellow top marking, the two side markings are on the back & there are also the cheek dots. The bill is right below where the lip would be. It DOES come with an explanation. If you watch the little shorts Sonic 'cartoons' on Youtube, you'll find the Team Sonic Racing ad / mini-show. In it, Eggman tries to trick Big (of Team Amy) into quitting the race by putting up a "Frog Merchandise Stand" with all frog themed items. This cap, and the t-shirt are among them. Wacky hi-jinx of course, ensue...but what's even wackier is that the Sega Shop decided to make the hat a real thing. This hat is about FORTY dollars! Plus, Froggy is fairly abstract to begin with so it's almost in "Secretly-Sonic" territory where even a big fan might not recognize what the cap is all about. And it's a 40 dollar hat. Is this even going to sell? Isn't the joke from the mini-show that the hat and tee are so silly & wierd that only Big the Cat would ever wear them? Even though it is explained, the whole situation remains strange. And Green. This is a 2019 item.